Record points funds announced for USRA Weekly Racing Series in 2011! Day 1 - Friday Action - 2010 Fall Festival! Day 2 - Saturday Action - 2010 Fall Festival! Sanders pockets $12,000 with RE/MAX USRA Modified Nationals win! 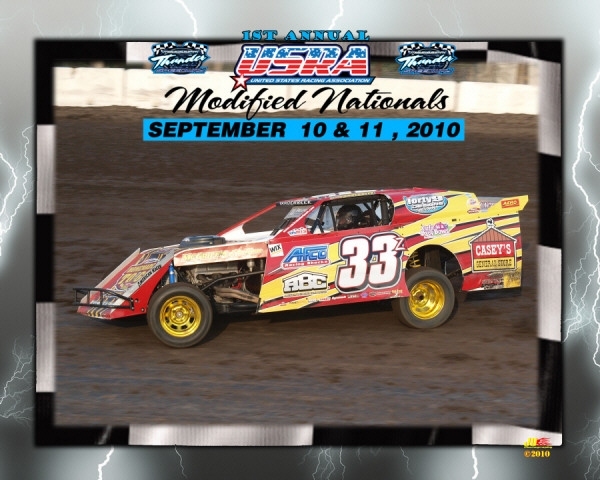 NOBLE, HARE & DAVIS TOP RAIN-DELAYED RE/MAX USRA MODIFIED NATIONALS PRELIMINARIES! 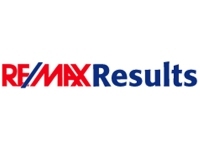 MISSISSIPPI THUNDER SPEEDWAY ANNOUNCES ADDITIONAL SPONSORSHIP AGREEMENTS FOR THE RE/MAX USRA MODIFIED NATIONALS! MISSISSIPPI THUNDER SPEEDWAY is excited to announce that Tony Buckland of Sunshine Sanitation of Winona, MN has stepped on board to Sponsor a $1000 bonus to the driver who is leading Saturday's USRA A-Mod main event at the lap 25 pit stop. VERSUS NETWORK CAMERA CREW WILL BE FILMING DURING 1st ANNUAL RE/MAX USRA MODIFIED NATIONALS AT MISSISSIPPI THUNDER SPEEDWAY! MISSISSIPPI THUNDER SPEEDWAY is excited to announce that VERSUS NETWORK was so impressed with MISSISSIPPI THUNDER SPEEDWAY during their August 20th visit to film action during the USMTS Special, that they've requested permission for a return visit during the 1st Annual RE/MAX USRA Modified Nationals, Scheduled for September 9th through September 11th! "I can't tell you how pleased we are about this return visit by the VS camera crew", stated MISSISSIPPI THUNDER SPEEDWAY owner Bob Timm, "This is a production crew and network that receives upwards of 300,000 viewers for their programming . 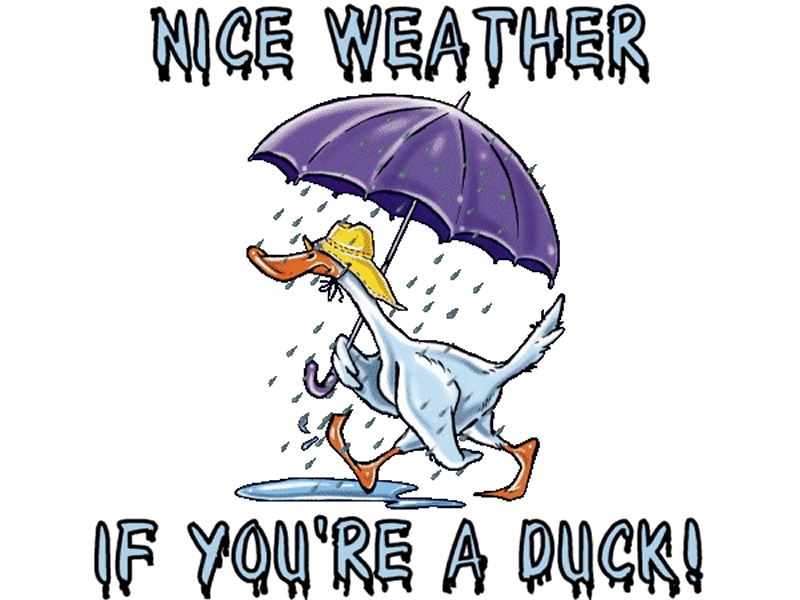 . . exposure like that for MISSISSIPPI THUNDER SPEEDWAY, not to mention dirt track racing in the upper midwest in general, is HUGE!" 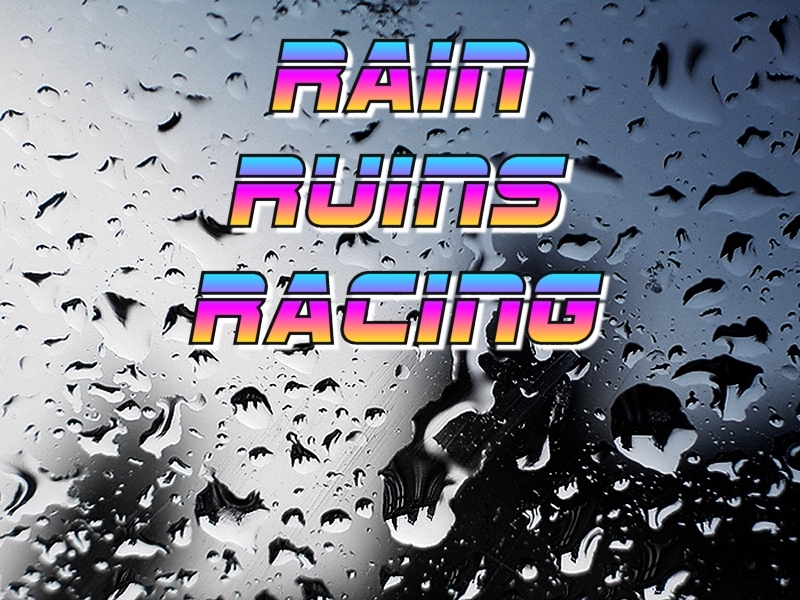 So make sure you join in for all the fun at MISSISSIPPI THUNDER SPEEDWAY during the 1st Annual RE/MAX USRA Modified Nationals September 9th through the 11th . . . you just might end up with your smiling face on VERSUS! SEASON CHAMPIONSHIPS WRAPPED UP AT MISSISSIPPI THUNDER SPEEDWAY! Ryan Gustin bounces back for "Hunt" victory at MISSISSIPPI THUNDER SPEEDWAY! 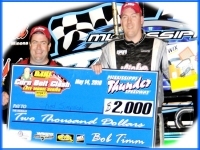 MISSISSIPPI THUNDER SPEEDWAY Announces 2010 Modified Point Champions Award! 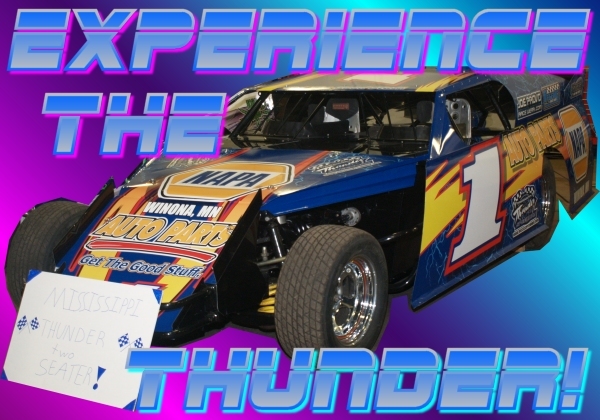 MISSISSIPPI THUNDER SPEEDWAY is honored to announce a special award for 2010 Season Point Champions in the Rivercity Manufacturing USRA Modified and TheEngineStore.com USRA B-Mod Divisions. 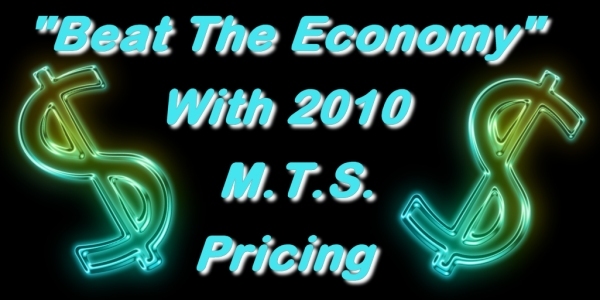 Extreme Powder Coating has agreed to donate a free chassis powder coating to the 2010 Points Champions in both the Rivercity Manufacturing USRA Modified and TheEngineStore.com USRA B-Mod Divisions! BOHNSTENGEL GRABS FIRST FEATURE WIN WHILE KANZ CLEAN SWEEPS & FORT GOES BACK TO BACK DURING BLAESER LAW NIGHT AT MISSISSIPPI THUNDER SPEEDWAY! Jay Oricchio and Coordinated Business Systems Add $750 to August 27th WISSOTA Super Stock Season Championship payout! MISSISSIPPI THUNDER SPEEDWAY is honored to announce a special sponsorship for the 2010 Season Championship event scheduled for August 27th. 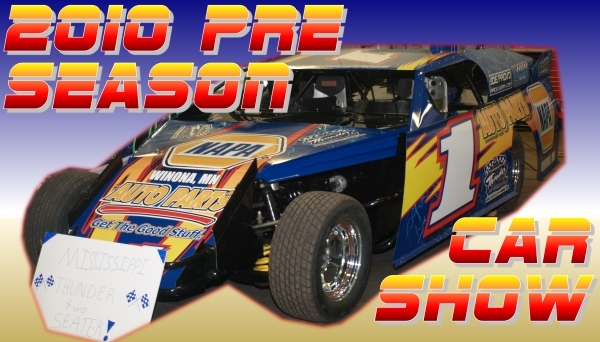 #37 Winona Auto Sales WISSOTA Super Stock driver Jay Oricchio and his racing sponsor Coordinated Business Systems have offered an additional $750 to be added to the Winona Auto Sales WISSOTA Super Stock payout for the 2010 Season Championship event scheduled for August 27th! 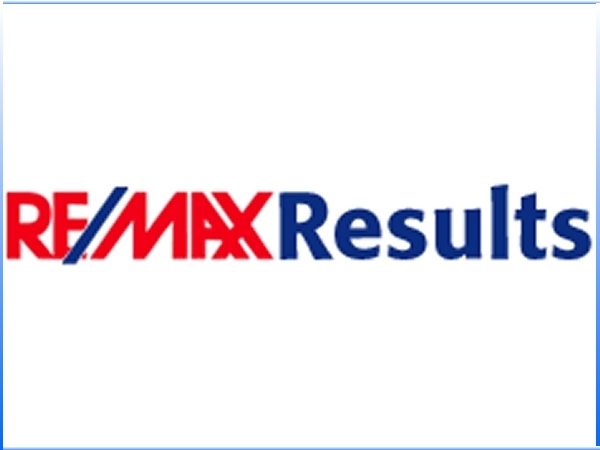 "We feel so honored that Jay and his sponsor Coordinated Business Systems have offered this extra money." stated MISSISSIPPI THUNDER SPEEDWAY owner Bob Timm, "An event sponsorship such as this is such a great bonus for the racers . 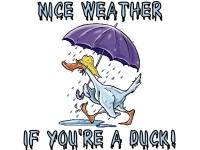 . . and we truly feel that it is an excellent advertising choice for a business. 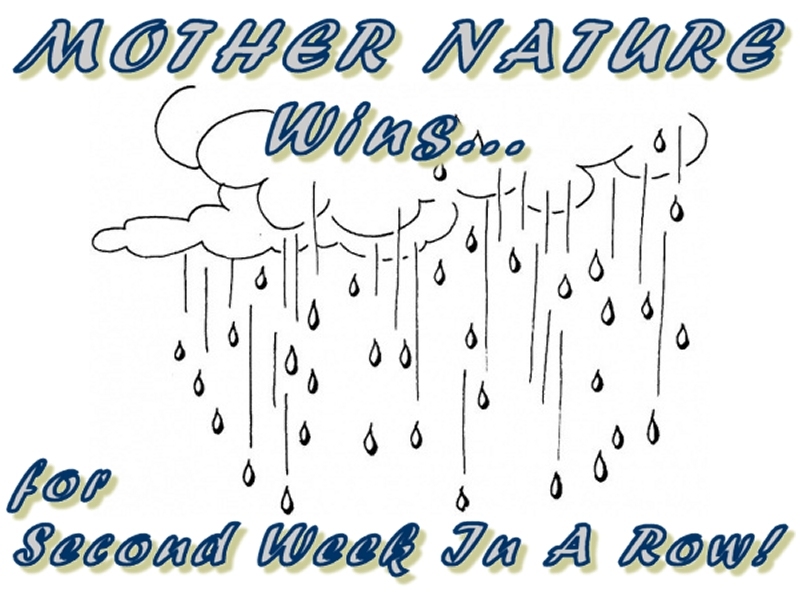 Again, we thank both Jay and Coordinated Business Systems for their involvment at MISSISSIPPI THUNDER SPEEDWAY." FORT, HANSON, WALSKI, ANGST AMONGST THE WINNERS DURING KG-BUD NIGHT AT MISSISSIPPI THUNDER SPEEDWAY! DONLINGER CASHES IN DURING RIVERCITY RUMBLE AT MISSISSIPPI THUNDER SPEEDWAY! BRAUER GOES BACK TO BACK & WASMUND NOTCHES FIRST WIN DURING LOU FEGERS RACING NIGHT AT MISSISSIPPI THUNDER SPEEDWAY! REDETZKE RACES TO $3000 DART CHALLENGE SERIES LATE MODEL WIN AT MISSISSIPPI THUNDER SPEEDWAY! WISSOTA STREET STOCKS INVADE MISSISSIPPI THUNDER SPEEDWAY WITH 1ST ANNUAL STREET STOCK NATIONALS! KANZ AND GANZ WIN DURING SEVERSON SINCLAIR NIGHT AT MISSISSIPPI THUNDER SPEEDWAY! 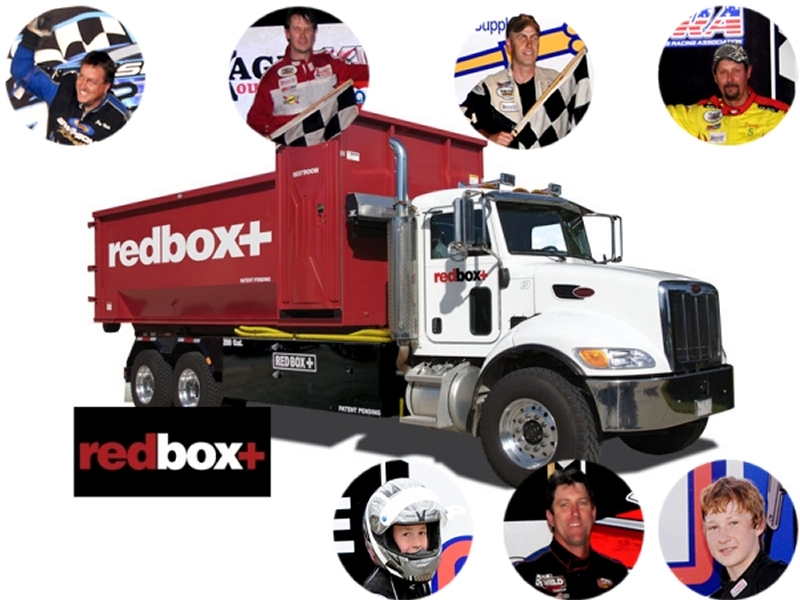 USMTS June Menu: 11 days, 8 races, 5 states, 11 tracks and more than $100,000 in prize money ... bon appétit! Sample the menu at MISSISSIPPI THUNDER SPEEDWAY June 25th! Shryock to Pilot NAPA Two-Seater At MISSISSIPPI THUNDER SPEEDWAY June 25th! 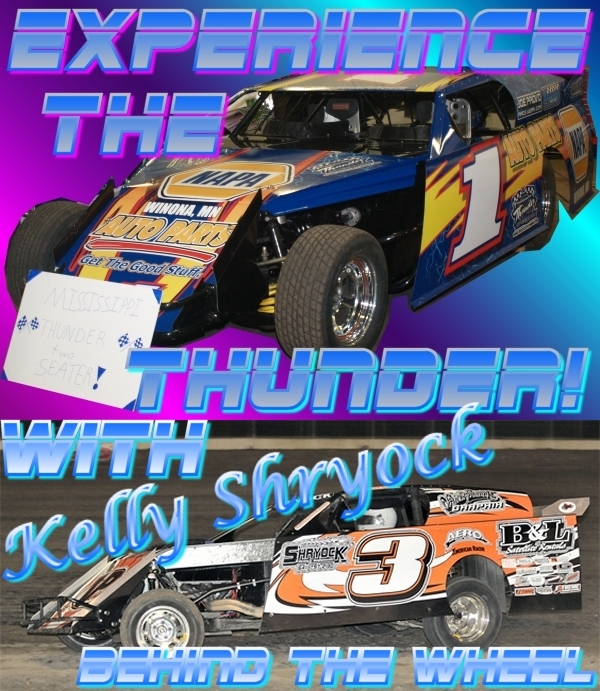 Friday June 25th, 9 time USMTS National Champion Kelly Shryock will be driving the MISSISSIPPI THUNDER SPEEDWAY Napa Auto Parts 2 seater - taking one lucky fan on the ride of their life. 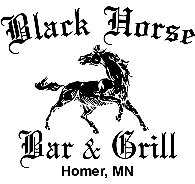 $2 raffle tickets for the ride will be on sale up until the end of the evening's heat races. 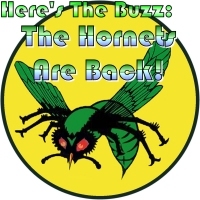 MISSISSIPPI THUNDER SPEEDWAY Releases Updated 2010 Hornet Schedule and Payout! 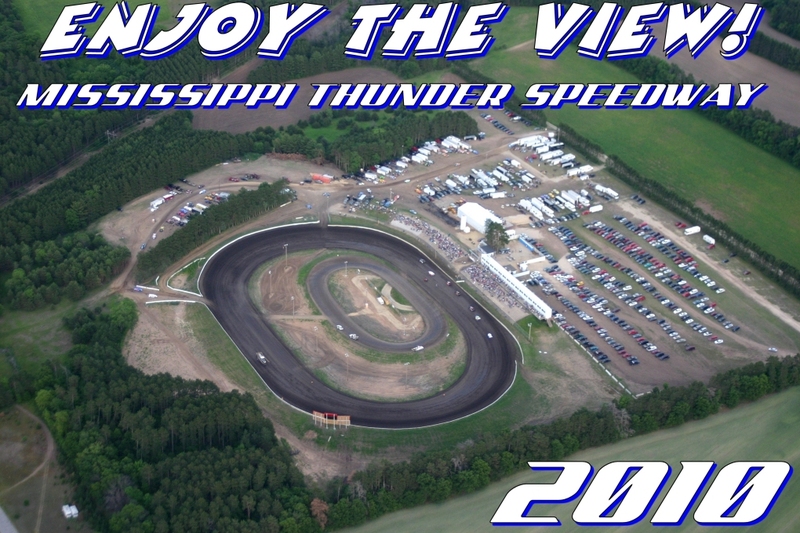 You Are Invited to ENJOY THE VIEW at MISSISSIPPI THUNDER SPEEDWAY! 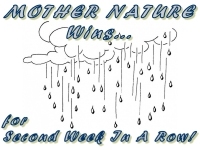 Weather Wins AGAIN At MISSISSIPPI THUNDER SPEEDWAY! Ben Anderson grabs the $1000 to win Baehman Law B-Mod Challenge at MISSISSIPPI THUNDER SPEEDWAY! 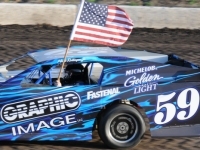 LINDER AND FORT TOP RIVALS, HERRICK WINS WISSOTA LATE MODEL DEBUT AT MISSISSIPPI THUNDER SPEEDWAY May 28th! 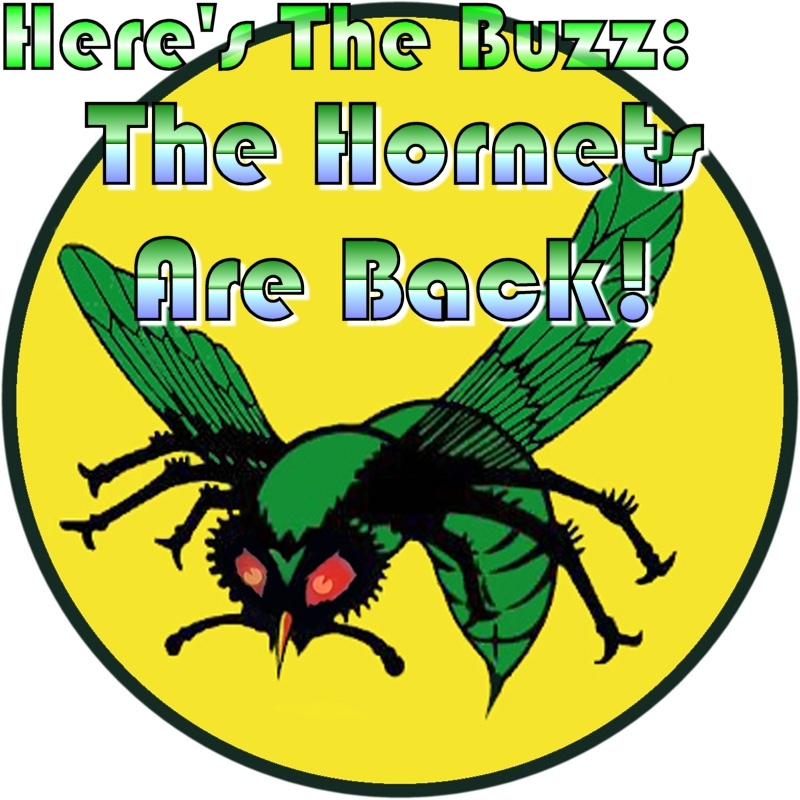 The Buzzing News: A Hornet Swarm Returning To MISSISSIPPI THUNDER SPEEDWAY June 4th! 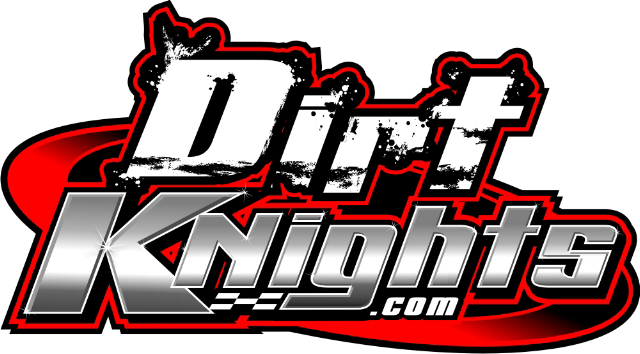 Ihrke, Wiersgalla, Langowski, Hanson, Matejka, Williamson, & Wagner Top Features At MISSISSIPPI THUNDER SPEEDWAY May 21st! 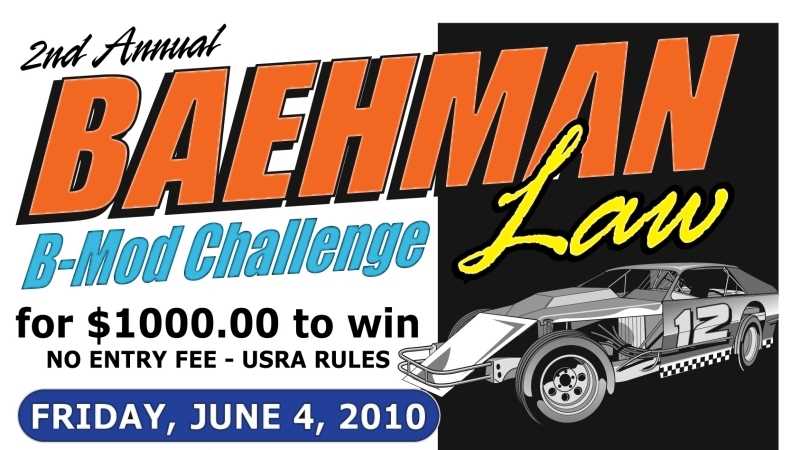 $1000 TO WIN BAEHMAN LAW B-MOD CHALLENGE Headed For MISSISSIPPI THUNDER SPEEDWAY June 4th! 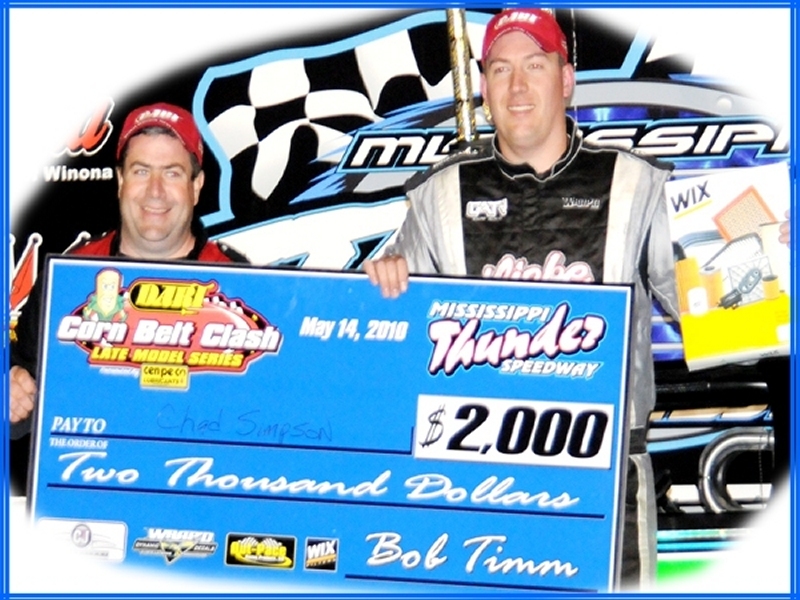 Chad Simpson Grabs The Cash As The Corn Belt Clash Late Model Series Rocked MISSISSIPPI THUNDER SPEEDWAY! Corn Belt Clash Late Model Series visits MISSISSIPPI THUNDER SPEEDWAY May 14th! Clash Up Next At MISSISSIPPI THUNDER SPEEDWAY! 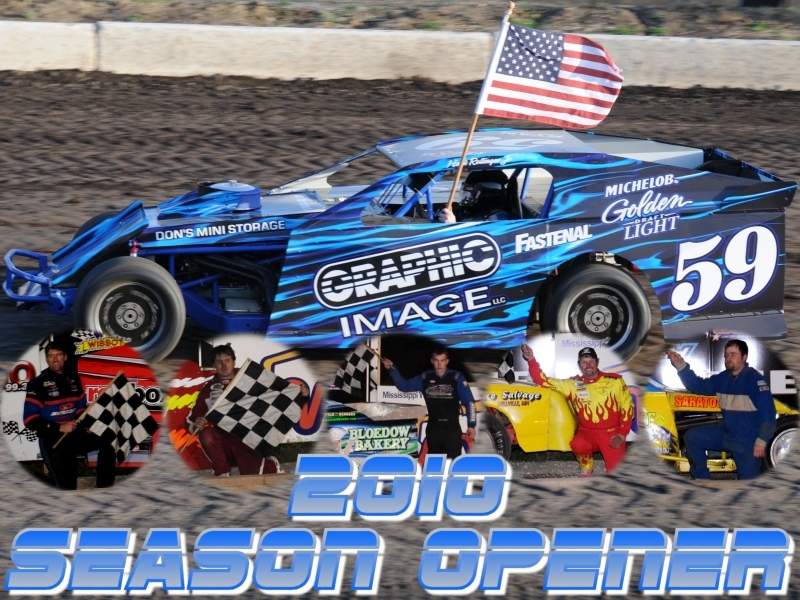 MISSISSIPPI THUNDER SPEEDWAY celebrates the 2010 Season Opener presented by GRAPHIC IMAGE! MISSISSIPPI THUNDER SPEEDWAY prepares to unleash The NAPA AUTO PARTS, LOU FEGER'S RACING EQUIPMENT Two-Seater!